Today marks the anniversary of Juliette Gordon Low’s first meeting of Girl Scouts in Savannah, Georgia, 100 years ago. Since that first meeting of 18 young ladies, the Girl Scouts have grown into a worldwide movement with 3.2 million adult and youth members. The Girl Scouts have been building character, confidence and courage in girls for a century, and are well positioned to be doing that for the next century and beyond. (http://www.girlscouts.org/who_we_are/facts/). The first Girl Scout troop in our local Girl Scouts in the Heart of Pennsylvania Council area was organized in Harrisburg in 1917. In Huntingdon County, a group of attractions has been working together for the past 4 years to develop and promote programming specifically for Girl Scout groups. Camp Golden Pond is a Girl Scout camp located just north of Petersburg, near Rothrock State Forest. The camp has year-round facilities and summer programming for Girl Scouts. 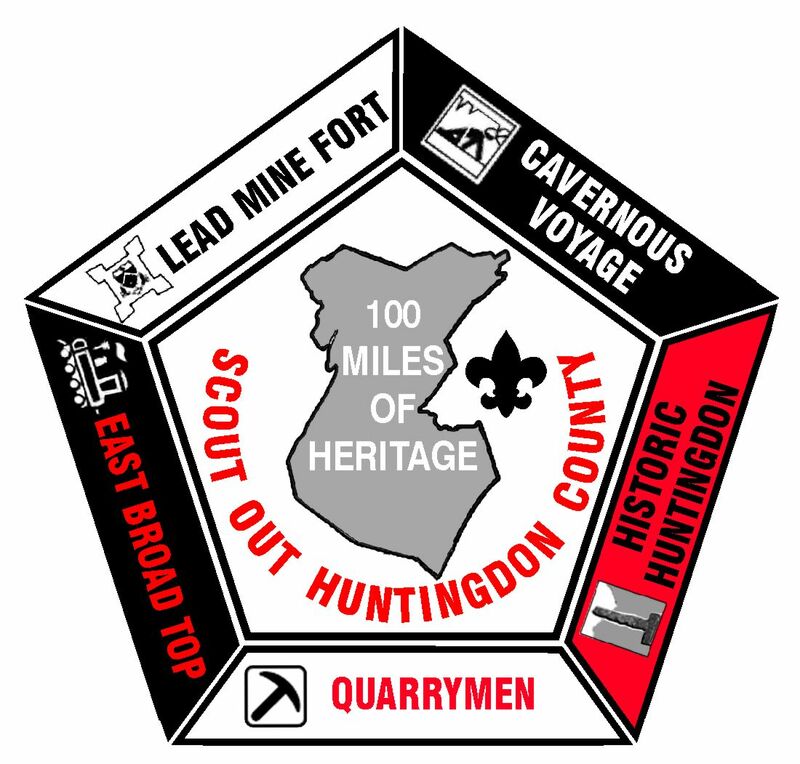 Scout Out Huntingdon County 100 Miles of Heritage patch with all five segments. Scout Out Huntingdon County: 100 Miles of Heritage is a biking, hiking, and paddling trail system that is designed to be completed in five weekends, or if your group prefers, tackle any three contiguous legs of the trail to earn the 50-Miler Award. This program features a central patch and a segment for each leg of the system. As your Scouts complete a leg, they earn the appropriate segment. The trail utilizes existing trails, rivers, and minor roadways to link interactive attractions, natural sites, historic sites, and campgrounds, giving the Scouts a unique learning adventure that is appropriate for their skill/achievement level. Lincoln Caverns, 3 miles west of Huntingdon, offers unique programming for all levels of Girl Scouts that explore the geology and natural world of caves. Lincoln Caverns also offers primitive camping to youth groups at its Warrior Ridge Campground. Shaver’s Creek Environmental Center, located about half-way between Petersburg and Pine Grove Mills also offers Scout programs for all ages. With it’s Raptor Center, nature trails, pavilions and regular programming, this is a great place for Scouting weekends any time of the year. Fort Roberdeau, located in the Sinking Valley section of eastern Blair County offers the unique opportunity for Scouts to live and dress like soldiers and citizens would have during the Revolutionary War. The historic site is also a county park with nature trails, a visitors center, pavilions and more. Old Bedford Village, located north of Bedford, offers Scouts the chance to experience 18th and 19th century life in Pennsylvania. Group programs include period appropriate trade immersion and crafts. Indian Caverns, located along Route 45 east of Spruce Creek, offers badge programs for grades 2-3, the “Eco-Explorer” Try-it and the “Watching Wildlife” Try-it. For grades 4-5, the “Wildlife” Badge and the “Rocks Rock” Badge. One unique program at Indian Caverns lets the Scouts actually spend the night in the cave! badges. If you would like to learn more about bringing your Scouts to the area, call the Huntingdon County Visitors Bureau at 888-729-7869. Happy Anniversary to the Boy Scouts of America! This week, the Boy Scouts of America celebrate their 102nd anniversary. In its century plus of existence, the BSA has molded millions of young men with its aims of developing character, citizenship and fitness. If you are involved in Scouting, as a scout, leader, employee, parent, or volunteer, we salute you. We’d also like to take this opportunity to highlight some of the programs that Huntingdon County offers to Scout groups. When Scouts complete any leg of the Scout Out Huntingdon County heritage trail system, they are eligible to earn the central patch, and the appropriate segment. Lincoln Caverns, 3 miles west of Huntingdon, offers unique programming for Cub Scouts, Boy Scouts, Venturers, and all levels of Girl Scouts that explore the geology and natural world of caves. Lincoln Caverns also offers primitive camping to youth groups at its Warrior Ridge Campground. Indian Caverns, located along Route 45 east of Spruce Creek, offers merit badge programs in Native American lore, as well as geology and others. One unique program at Indian Caverns lets the Scouts actually spend the night in the cave! Many other sites in the Raystown Lake Region provide opportunities for Scouts to advance, or complete partial requirements for merit badges. If you would like to learn more about bringing your Scouts to the area, call the Huntingdon County Visitors Bureau at 888-729-7869.